Those who aren’t Londoners probably haven’t heard of Harry Beck. Even a few who are Londoners might not have either. But I’m fairly sure most of you will recognize or even used his work. In 1931 he created what IMHO is the best illustration of how modelling and abstraction – and great graphic design – can combine to create a diagram which is SO much better than what went before, it has become a design icon. 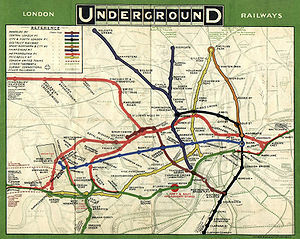 London Tube Map – 1909, from Wikipedia. The map is geographically accurate – the streets are marked in pale grey – and so the stations are in their correct places. It has a single abstraction, in that the lines are colored, not in the ones we use today, which makes it look strangely ‘wrong’ to modern eyes. For those who know their way around London already, this is great. If you don’t. and you want to make a tube journey, its a bit harder. 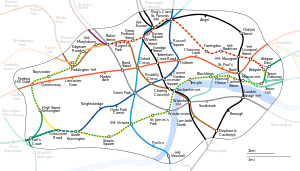 There’s too many ‘ideas’ in the same diagram: Geography AND tube lines AND tube stations. Beck’s insight was to play-down geographical accuracy, and create a more schematic diagram, which used a minimal number of line directions (horizontal, vertical, diagonal) and most importantly, spread-out the stations, so that they are approximately spaced according to travel time, not physical distance. There have been lots of attempts to go back to the pre-Beck idea of geographical accuracy, but none seem to have the appeal of Beck’s abstraction. Beck’s maps, like any abstraction, have their drawbacks. They don’t tell you that it’s quicker to walk from Covent Garden to Leicester Square – than take the tube: it’s only a block. Or that from Paddington mainline station, the quickest way to get into the city is to walk to Lancaster Gate and take the Central line. Looks like miles away on Beck’s map. What Becks map definitely does have is a small and clear set of ‘ideas’, which he reduced to the minimum needed for a specific job – navigating the tube system. OK, so when you emerge from the tube station, the first thing most of us do is stare around to get our bearings in the ‘real world’, or look at a street map. So it’s not the only abstraction we need to get around. More are needed for some purposes. But his maps are famous for their clarity and utility. Which is why they are the standard for transport maps all over the world. If we can create abstractions which are this clear and this useful, then we’re really being modellers.